Yesterday’s Sound Transit Board meeting featured lots of talk about bus drivers and Rob Johnson. Board members, Sound Transit CEO Peter Rogoff, and union officers praised the heroism of Metro bus operator Eric Stark, who delivered dozens of passengers to safety after a gunman opened fire on Stark’s bus and general traffic on Lake City Way on Wednesday. The gunman murdered two people, and wounded another person in addition to Stark. Seattle Mayor Jenny Durkan said that she met Stark and his wife, Kim, who is also a Metro driver, at Harborview. Durkan said that Stark is “doing well and recovering,” and lauded his “heroism and selflessness.” Durkan also revealed that the other wounded person is a 2nd grade public school teacher. “I think most of us here take transit frequently, and we know that we have tremendous employees who serve the public every single day. They do little acts of heroism all the time. There are times when people devalue public service, and the value of public employees, but that guy saved people’s lives yesterday,” said Board member Claudia Balducci. Kim Stark isn’t the only member of the family who is a bus driver. According to Amalgamated Transit Union (ATU) Local 587 Vice President Cory Rigtrup, who spoke briefly during the public comment period, Kim’s brother, father, and uncle are or were Metro operators. Rigtrup cited the Starks and their family as an example of the benefit of public employment. “They tell their family it’s a great place to work, it’s a great service,” Rigtrup said. The pronounced focus on bus operators and government employment was closely related to the day’s policy business. In his regular update to the board, Rogoff said that Sound Transit is backing off plans to bid out future bus operations to private contractors. “Following concerns from our labor partners, and after discussions with Sound Transit’s board chair and our vice chairs, stakeholders, and other concerned board members, I have directed that we take a pause on this procurement,” Rogoff said about the potential staffing bid process. The board—which is majority Democratic—and labor groups quickly rallied to beat back talk of hiring third-party, non-union workers. Outsourcing now seems unlikely. 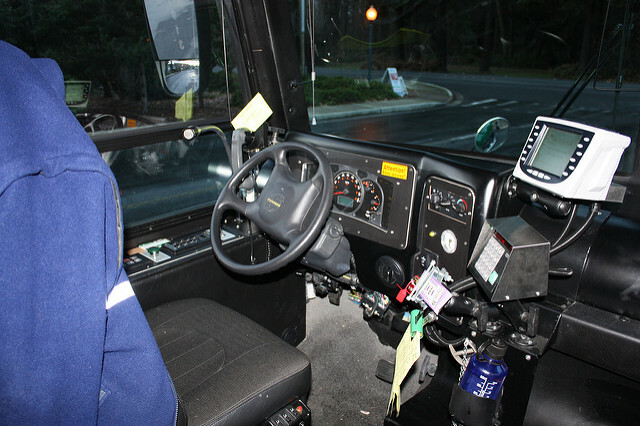 The county, however, does operate the Ride2 service in West Seattle and Eastgate using non-union personnel via Hopelink. Less than a year ago, Durkan’s administration made a very similar attempt to hire third-party transit operators. And the idea was quashed just as quickly and definitively by ATU Local 587 and the MLK Labor Council in the form of an 8-0 Seattle City Council vote against the proposal. On a lighter note, Johnson, a Board member, is resigning his seat on the Seattle City Council on April 5. He’ll give up his seat on the Board as well. Board Chair John Marchione presented Johnson with a commemorative plaque that would surely make Drew Brees jealous. Johnson’s transit and urbanism legacy is enormous. He quarterbacked (pun intended) the campaign for Sound Transit 2, which ensured the survival of the agency and continues to fund Link construction. Johnson also was essential in upzoning parts of Seattle. On the Sound Transit Board, Johnson helped craft the agency’s model TOD policy, and was an essential bridge between Seattle and suburban members. I can say, having watched an alarmingly high amount of Board meetings over the years, that Johnson and Balducci’s good-cop, bad-cop routine was a frequent highlight of the proceedings—and a productive one. This is Seattle’s mini version of Brexit. Put ourselves in a terrible position, propose a necessary short-term fix that no one loves, people get mad, everyone grandstands, everyone punts, and riders lose. The closest counterpart to Brexit would be Washington state seceding from the US. The ST bus issue is a combination of Metro having no space in its bases for more buses, ST needing more buses for ridership demand, and ST considering a possibly non-union contractor, The union issue gets into union excesses on the one hand (mostly exaggerated but some aspects are real) vs the fact that the US has no social safety net with a decent minimum that could replace union bargaining. So if you deunionize bus drivers, it’s a race to the bottom with wages and job security and benefits, and people can’t survive or raise families on that. At the same time, ST needs more buses now, so maybe it needs to contract with another provider short-term. Brexit is nothing like that. Brexit featured: Russian propaganda that repatriated EU contributions would pay for a large increase in the National Health Service, and and three parliamentary votes against the negotiated exit plan that were the largest Nays in centuries. The Puget Sound has a long history of pro-union employment, which has led to a higher quality of life and much more desirable work force than other regions in our country and Sound Transit is no exception. It’s little things like hiring “temporary” non-union drivers that slowly weakens the strength of a union. ATU Local 587 and the ST Board are absolutely right to shut down any talk of non-union drivers. That said, it’s understandable that we have a shortage of bus drivers, but is there a reason why the third party hires can’t be part of ATU Local 587? Hiring part time union workers as work become available works for other industries, why can’t it work for transit? It’s not a shortage of drivers that caused ST to consider a private contract, it’s the lack of space in Metro’s bases for more buses. The driver shortage was during the early years of the recovery. While the union support is great, it’s also important to recognize that driving a bus requires skill. It may not be as difficult as a 737, but it does involve navigating busy streets including curb position, and handling rider issues from wheelchairs to fare evasion to on-board vandalism and violence to maintaining on-time performance. Drivers handle large and potentially dangerous pieces of machinery and their talent is comparable to highly skilled trades. Temporary drivers potentially ignore that. The shooting happened on just off Sandpoint Way – Not Lake City Way. The Puget Sound region is one of the few segments of the nation that utilizes nearly all Union Transit operators, with a few exceptions. This is a good thing for the employees of the transit systems however the amount of funding gobbled up by Sound Transit, Metro and the other area agencies is staggering. And who ultimately pays for this? The taxpayers. At one particular time the funding may not be there for these massive Transit projects and operations. Keep in mind also that King County Metro drivers learn nearly twice the average salary of a bus driver in most US cities.